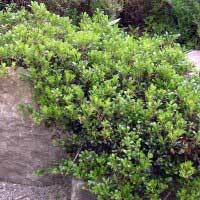 This is one evergreen ground cover that does best in the sand and/or on a hill slope. It does not do well in heavy, compacted soils where it tends to languish. On sandy hillsides it can be surprisingly lush and help protect from erosion. Bright red berries give some color late in the season and are eaten by wildlife. Drought tolerant.